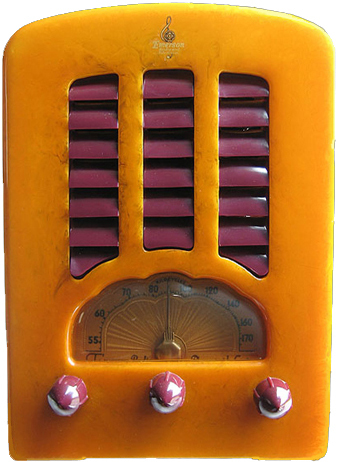 "Dressing your body with anointing oil is one way to get the spiritual benefits desired, but there are other, more subtle methods, and amng these one of the best-kept secrets is selecting and wearing hair care products that reflect and symbolize the conditions you are working for in the realm of mastery, success, love, and luck." The items shown here are a container of Royal Crown Original Hair Dressing and a container of Queen Rezolium, a light hair dressing for women. 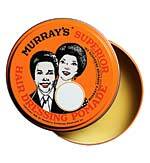 Other well-known pomade or "hair grease" products of this sort include Tuxedo Club Pomade and Murray's Superior Hair Dressing. Long popular in the African American community, these and other toiletry products are still made in Memphis, Tennessee, in the same way they have been for decades. 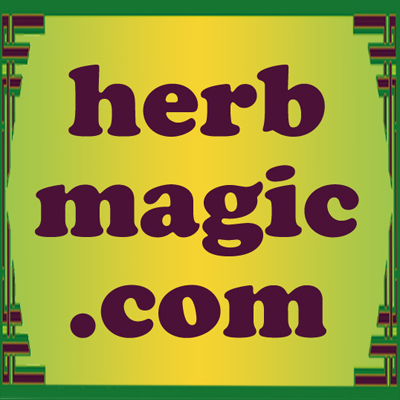 Like our own Lucky Mojo line, these traditional hair care products contain fragrances and emblems with symbolic resonances that are widely recognized among hoodoo practitioners. 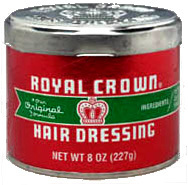 For instance, the crown image stamped into the metal lid of the Royal Crown Hair Dressing container is evocative of the same image found in Crown of Success. Likewise, the Queen Rezolium name evokes that of Queen Elizabeth Root, an herb frequently utilized by women who wish to get their way in love affairs, while Murray's Superior Hair Dressing Pomade, with its image of a happy couple enjoying one another's company, is symbolic of love and sexual potency. Hair grease with vintage packaging labels such as these inspire both consumer confidence and spiritual confidence in those who are familiar with them. For people wishing to add shine to the hair without the heavy or stiff control of a pomade or hair grease, fluid or liquid hair oils called brilliantines are employed. Of these, one of the most traditional is Hoyt's Bergamot, manufactured by the makers of the famous Hoyt's Cologne. The inclusion of Bergamot essential oil in this formula implies to the savvy hoodoo practitoner that this brilliantine can be worn in situations where one wants to dominate, command, or control others, for that is one of the used attributed to Bergamot. Another much-loved brand of brilliantine is Tres Flores or Three Flowers, which comes in a distinctive and old-fashioned three-lobed glass bottle. Golden Tres Flores hair oil is especially favoured by Mexicans for making long, dark hair shine and also for bringing good luck, happiness, and cheerfulness to the wearer. Order Hair Care Spiritual Products from the Lucky Mojo Curio Co.